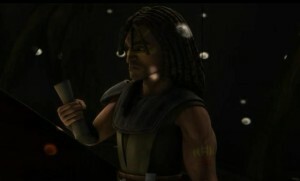 Quinlan Vos to Kenobi: "My senses tells me that he is still here"
Having received the recently released “Star Wars: Dark Disciple”, featuring Asajj Ventress and Quinlan Vos, which serves as somewhat of a follow-up to “Star Wars: The Clone Wars”, I thought I would look at the only time that Quinlan Vos has appeared on-screen. 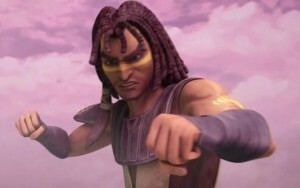 The only time that Quinlan Vos has appeared on-screen was in the “Star Wars: The Clone Wars” episode “The Hunt for Ziro”, which took place in the third season (yes, Vos also briefly appears on-screen in the sixth season episode, “Destiny”, in a vision of Yoda’s, too, but we don’t see much about him there) (and, yes, he seems to appear in the background in one of the scenes in “The Phantom Menace”, but he plays no significant role in the movie). For Obi-Wan Kenobi to call a fellow Jedi “crazy” is particularly fascinating, considering that he closely knows Anakin Skywalker! When Vos hops out from the Republic gunship, he does a high jump and brushes his shoulders off, as if that was a typical jump. 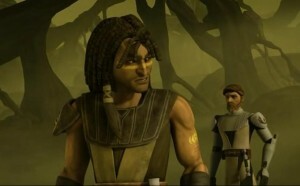 He casually greets both Commander Cody (“Hey, Commander, looking good”) and Obi-Wan Kenobi (“Kenobi, you look worse for wear”), giving off an air of nonchalance and almost an affect like that of a California surfer, which is helped by his tan, muscular body, and dreadlocked hair, as well as a peculiar horizontal yellow tattoo across his face. In this initial conversation, it is clear that Kenobi does not care for Vos and his flippant ways, while Vos does not seem to like the uptightness of Kenobi (and, perhaps, Jedi Temple culture?). After realizing that Ziro had been jailed, then had escaped, they then head after him, beginning to track him through the swamps of Nal Hutta. It’s clear that Kenobi is issuing a sarcastic comment, although Vos does seem to prove himself. On Teth, Vos and Kenobi find a dead Ziro the Hutt, but also encounter Cad Bane, causing them to fight. 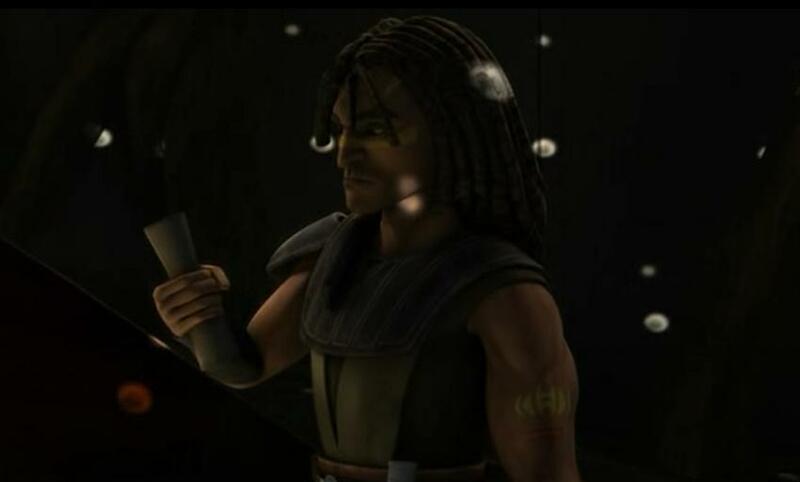 Inasmuch as his roguishness certainly sets him apart, as well as his initial cockiness and nonchalance mark him unique amongst Jedi, we actually see him transform during this episode. Once he touches the goblet and has his vision (using his psychometric abilities), his demeanor becomes serious and focussed from that moment on and throughout the rest of the episode. So, it would seem he’s not entirely about fun and games….